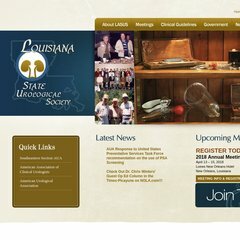 Topics: Meetings, Clinical Guidelines, Government, Louisiana State Urological Society, Southeastern Section Aua, and American Urological Association. The site is programmed for ASP.NET. It is hosted by Rackspace Hosting Texas, using Microsoft-IIS/6 web server. Its 2 nameservers are ns14.domaincontrol.com, and ns13.domaincontrol.com.